Both purified and spring water are popularly bottled for public consumption. Utilizing appropriate procedures, they are assessed by the National Primary Drinking Water Regulations and are safe for drinking. When it comes to their differences, the following concepts exhibit that they mainly differ as to source, dissolved substances, and treatment. From its name, purified water decreases its contaminants to no more than 10 parts per million. As compared to other kinds of drinking of water, it is more stringent in filtering away impurities. Hence, almost any source of water can go through purification for drinking purposes. Distilled water is obtained by boiling the water and collecting the condensed vapor. Previously distilled water from slow boiling is again slowly boiled. Deionized water had most of its mineral ions (cations and anions) removed and is almost as pure as distilled water. Demineralized water is “softened” by replacing its undesirable minerals with more appropriate salts so it can be used for certain chemical processes. As compared to deionized water, demineralized water has a higher conductivity. Spring water is located beneath the surface of the ground. It is often accessed through a well and it may or may not go through a treatment process. Many individuals claim that spring water tastes better as it is enriched with more minerals. Artesian spring water surface due to the pressure in the aquifer, an underground layer of permeable rock which contains water. Gravity spring water is formed from water that seeped through layers of soil until it reached an impervious layer. It then flows above the confining layer until it surfaces on cliffs, hillsides, etc. As it name suggests, tubular spring water is contained in tubes such as caves, limestone cavities, or spaces formed from cooling lava. Seepage spring water slowly surface and has a low flow as it does not have much pressure like artesian spring water. It does not get confined in an aquifer and is often found in ground depressions. Associated with volcanic activity, thermal spring water are also known as hot springs, geysers, and mud pots. Obviously, they are not ideal for drinking but are often sought after for spa purposes. Purified water may come from any source while spring water comes from an underground source. Purified water goes through stringent treatment processes for the removal of pathogens and other unwanted substances. On the other hand, spring water may sometimes be safe for drinking even without a treatment process as it is naturally filtered as it passes through layers of stones/rocks. As compared to purified water, the quality of spring water when it comes to sanitization may often be lesser as it does not go through strict treatment procedures. As compared to purified water, spring water contains more minerals since it goes through an underground natural filtration process. Some of the dissolved substances that may be found in spring water are sulfur compounds, salts, calcium, and magnesium. Spring water has a “sweeter” taste as it has significantly more minerals than purified water. As compared to purified water, spring water has more alkaline as its pH level is nearer to the neutral range. Many espouse that though both purified and spring water quench thirst, the latter is better absorbed. Fresh water contains natural levels of minerals that are conducive to intestinal absorption. Hence, spring water is easily transported into the bloodstream. Spring water is often more expensive as it is more difficult to access as compared to purified water. Due to its treatment process, purified water may contain more chemicals such as chlorine. A number of fitness advocates would say that spring water is generally healthier as it has more minerals and is linked with better absorption. Purified water is also used in pharmaceutical processes, industrial, cosmetic, and other related processes. On the other hand, spring water may also be used for various domestic needs, electricity generation, and irrigation. As water is highly essential for survival, spring water, unlike purified water, is more connected with the growth of a community especially that many people with health concerns would like to drink from mineral waters and relax in thermal springs. Both purified and spring water are generally safe for drinking. 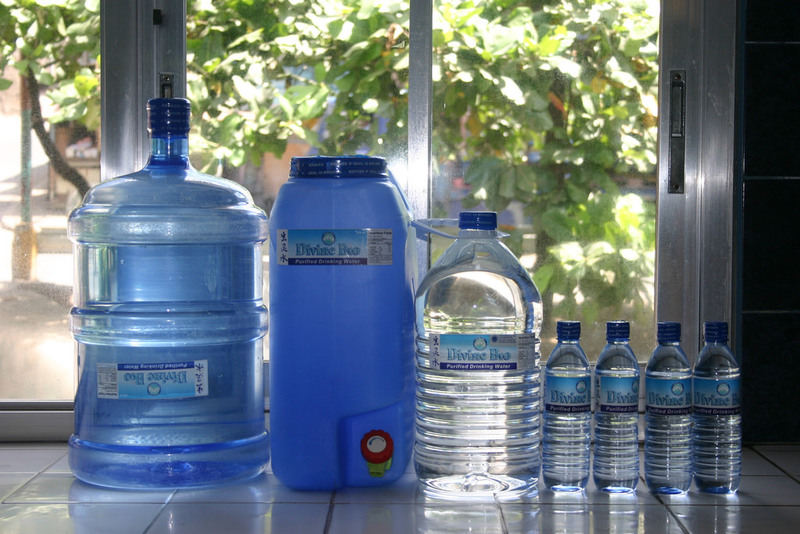 Purified water may come from any source and is purified through stringent procedures. Hence, it is more sanitized and acidic. Spring water comes from an underground source and goes through natural filtration. Thus, it has more minerals which gives it distinct “sweet” taste. Spring water is often more expensive as it is more difficult to obtain and is advertised as having more health benefits such as better hydration. Purified water is ideal for chemical and industrial processes while purified water is also used for domestic and agricultural purposes. 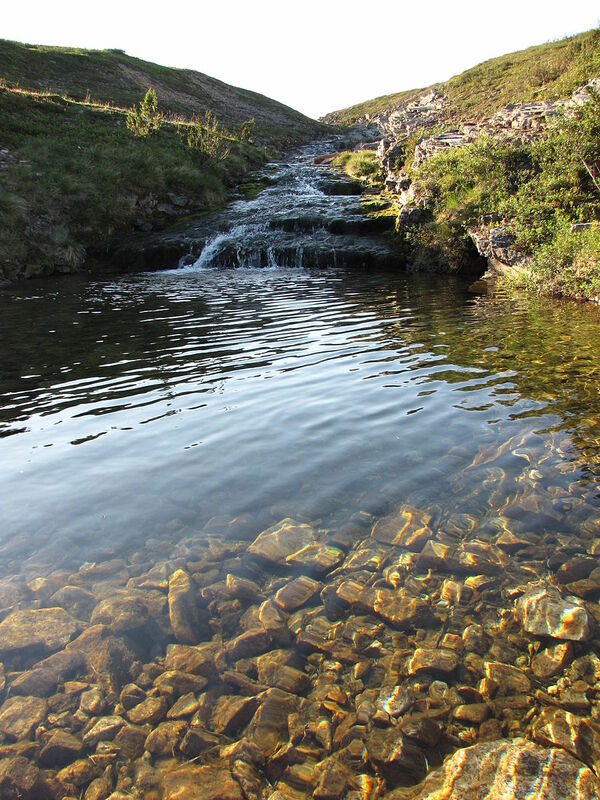 Spring water is linked to community growth as it is beneficial for domiciliary purposes. gene balinggan. "Difference Between Purified Water and Spring Water." DifferenceBetween.net. 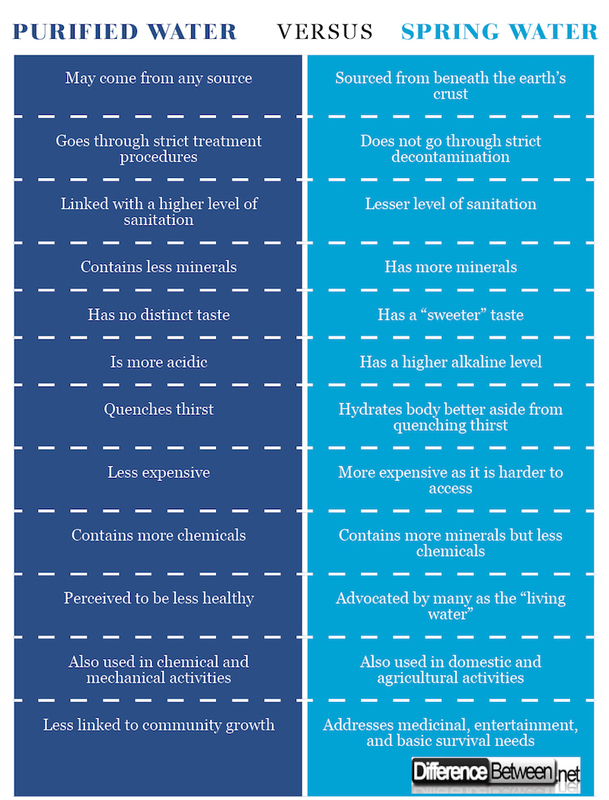 June 5, 2018 < http://www.differencebetween.net/science/health/difference-between-purified-water-and-spring-water/ >. Ingram, Colin. The Drinking Water Book: How to Eliminate Harmful Toxins from Your Water. Berkeley: Celestial Arts, 2011. Print. George, Lois. Uses of Spring Water. Berlin: Springer, 2001. Print. McKay, Daniel. How to Purify Water. Seattle: Create Space Independent Publishing Platform, 2012. Print.